When I first became interested in Royal Enfield motorcycles I was delighted to read that the post-war Royal Enfield Bullet was exceptional because of its "advanced rear suspension." Ignorant as I was of motorcycle design, I wondered what this great 1949 advance in rear suspension might be. But none of the books seemed to explain. Only later did I come to realize that the great step forward was this: the Bullet had a rear suspension at all! I had never realized that the terms "hard tail" or "rigid" when applied to motorcycles meant that the rider was cushioned by no rear suspension whatsoever. My spine ached, just at the thought. Eventually I read that early riders wore kidney belts to protect themselves from the lashing blows inflicted by the rear wheel. No wonder those old-fashioned solo seats had springs! Once I knew the meaning of "hard tail", the term "soft tail" defined itself. This would be any motorcycle with an effective rear suspension. "Soft Tail," in the United States, usually refers to the Harley-Davidson motorcycle that got a swing-arm rear suspension in 1958 (about time). For some, things are never soft enough. 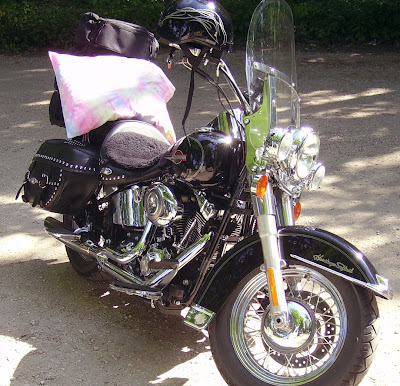 I was amused to encounter this Harley-Davidson Heritage Softtail in Wisconsin; the slender young woman riding in back had added a little cushioning of her own: a nice pink tie-dyed pillow. The generally accepted terminology is swingarm for a bike with dual visible shocks. Softail refers to a bike with the look of a rigid frame but with a shock concealed beneath the frame . Of course their are hybrids ( see Vincent ) . George, thank you for the explanation!